For some Midwestern utilities, 2018 was the year that happened. That followed some big steps by Consumers Energy in Michigan and NIPSCO in Indiana, which issued plans to shut down coal-fired power plants sooner than previously planned while also accelerating development of wind and solar power. These corporate decisions are part of what made 2018 a fulcrum year for the clean-energy transition, a time when long-building trends in energy consumption and pricing have led to a clear shift in the market, according to analysts and clean-energy advocates. These dynamics are most noticeable in the Midwest because of extremely low wind energy prices, but they are spreading to other regions. "In the Midwest in particular, renewable energy is a win-win for utilities and the ratepayers at this point," said Travis Miller, director of utilities research at Morningstar. Wind energy is rising in prominence at the same time that fossil fuel plants are looking increasingly risky from a financial and regulatory perspective, he said. This is the change that environmental advocates hoped for, following a tantalizing few years that pointed in this direction. "2018 has been a turning point, as some utilities are beginning to make decisions based on the market of the future rather than that of the past," said Howard Learner, president and executive director of the Environmental Law & Policy Center. Utilities' long-term plans were being released at the same time that the Midwestern landscape, especially in rural areas, continued a visual transformation that shows the rise of clean energy. Wind farms are now a familiar part of the view, especially in western Iowa, southwestern Minnesota and other parts of the region's wind belt. And, solar power is growing, with projects planned in many areas, including across Illinois and in Ohio. Xcel Energy, which has 3.6 million utility customers, has been on the leading edge of reducing use of fossil fuels and investing in renewables, a status the company took to a whole new level with its zero-carbon pledge in December. This announcement was motivated in part by company executives reacting to recent reports about the acceleration of climate change, said Ben Fowke, the president and CEO. "We knew we could step up and do more, at little or no extra cost," he said at a news conference on Dec. 4, 2018. Xcel has more than 240,000 electricity customers in Wisconsin, primarily in its western half. The company also has just over 100,000 natural gas customers in the state. 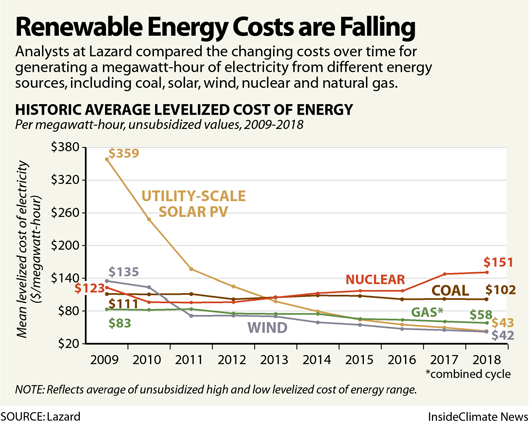 The cost of utility-scale solar power has dropped significantly over the past decade. Xcel may use nuclear power as part of the mix to reach its goal, part of a belief that "all technologies must be on the table," said spokesperson Lisa Kiava. Nuclear power plants emit no carbon, but there is deep division among environmental advocates on whether nuclear should be considered "clean energy," largely because of its radioactive waste. Another factor utilities have to consider is the potential for policy changes. Colorado in November elected Democrat Jared Polis, who ran for governor on a plan to have the state rely completely on renewable energy by 2040. Xcel is the largest electricity utility in that state. Consumers Energy, which provides electricity to 1.8 million customers, issued a plan in June to overhaul its electricity generation fleet over the next two decades and embrace solar power. It was a striking change of course for a company that has relied heavily on coal. "Our vision considers people, the planet and the prosperity of our state and the communities we serve," Patti Poppe, the company's CEO, said in a statement released with the plan. NIPSCO, which stands for Northern Indiana Public Service Company, distinguished itself among its Midwestern peers in 2018 by proposing to close of all of its coal-fired power plants within 10 years. The plan, which is still being reviewed by regulators, is striking because coal is 65 percent of the company's power plant capacity, which is unusually high. NIPSCO, which has 468,000 electricity customers, says its proposal is workable and desirable because building new renewable energy is more cost-effective than maintaining old coal plants. For publicly traded utilities, actions to address climate must make sense financially. This is the part of the equation that has changed to make possible these major moves. One of the key variables is that electricity use has been close to flat since the late-2000s recession, due in part to the rise of energy efficient lighting and broader changes in the economy, said Travis Miller of Morningstar. This means utilities can no longer count on paying for major projects with future revenue increases from rising electricity use. It places a premium on projects that have less risk. One of the financial risks is that future state or federal laws or changes in commodity prices will make natural gas fired power plants unable to compete on the market. "Utilities have to look at every investment as a multi-decade investment," Miller said. "We've seen enough commodity market volatility in the last two decades and enough environmental policy making in the last two decades that utilities are very hesitant to invest in very large legacy fossil fuel plants." Xcel, Consumers and NIPSCO were able to make their plans in large part because the cost of generating wind energy is unusually low in the Midwest. This puts Midwestern utilities ahead of the curve in their ability to rely on renewable energy, and may indicate what is on tap in other parts of the country as renewable energy becomes more affordable in other regions, said Howard Learner of the Environmental Law & Policy Center. "It's a matter of environmental value and economic justification," he said. Editor's note: InsideClimate News is a non-profit, non-partisan national news outlet that covers climate, energy and the environment. This article was originally published on Jan. 2, 2019.